March 2018 update: The Whistler Tree has been named the 2018 European Tree of the Year. It couldn’t have gone to a more deserving tree! Trees can be useful in many ways. They can provide food through fruits or nuts, building materials by milling their trunks, or shade in cities beneath their canopies. But the Quercus suber has been used for centuries for a different purpose: its bark is the source of cork. The versatile material can be harvested many times throughout a tree’s lifetime, but one particular tree in Portugal is so large that it produced more cork in a single harvest than most others in their entire life cycles. Cork is used in so many products today that it can be easy to forget just how long it has been around. Like now, it was used as a bottle stopper thousands of years ago. Remains of cork stoppers have been found in ancient Egyptian tombs. Romans and Greeks also used the lightweight material as floats for fishing nets and as a soft, heat insulating material for floors and shoes. The trees also had a strong symbolic meaning in ancient Greece, and only priests were allowed to cut them down. Nowadays there are countless uses for cork. It can be found in everything from musical instruments to spacecraft heat shields. A new method of using waste and recycled cork by combining it with a binding agent was developed by a German company in 1890. This meant it could be rolled into sheets and cut into any shape imaginable. Natural, sustainable, recyclable, and versatile, it’s no wonder that cork remains such a sought after material. Cork comes from an unusual source – it’s the spongy bark of the Quercus suber, or cork oak tree. The trees are native to the Mediterranean, and live an average of 200 years. 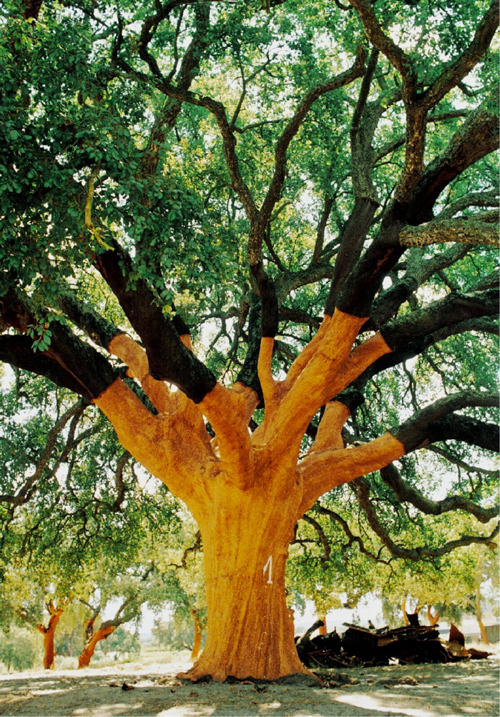 It takes 25 years for cork oaks to reach a diameter of 70 cm (27 in), when their bark is stripped for the first time. Stripping the bark by no means damages the tree. It regenerates naturally, and in fact, stripped trees sequester much more CO2 than trees left to their own devices. The first harvest, called ‘desboia’, produces poor quality cork, and needs to be processed heavily before use. The next harvest doesn’t happen for another 9 – 18 years, until the second harvest, or ‘secundeira’, takes place. This harvest is slightly higher quality, but still unfit for bottle stoppers. Starting with the third harvest, more than 50 years since its planting, cork oaks produce high quality material. The bark is stripped with an ax, carefully as not to damage the tree itself, and left outdoors for 6 months to stabilize. Most of it is destined to become bottle stoppers, which continue to be hugely popular for another legendary Mediterranean product: wine. No where in the world are cork trees more common than in Portugal. 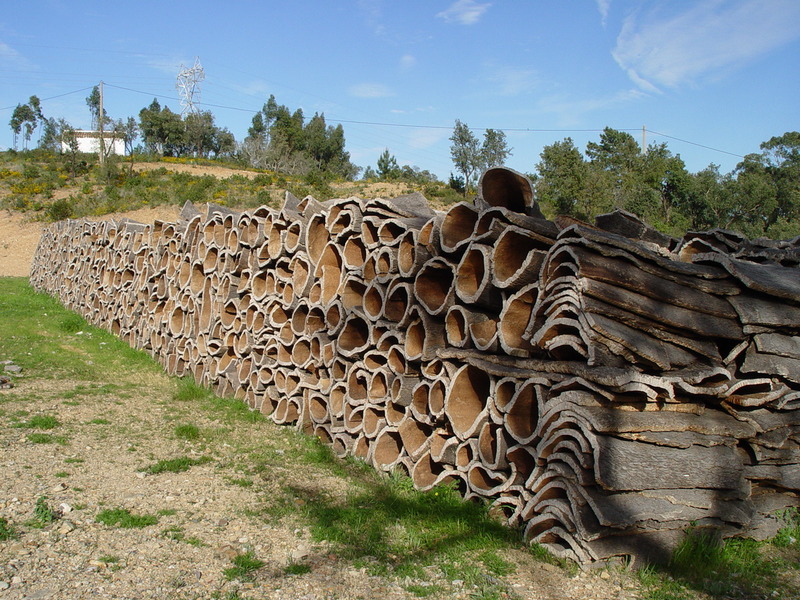 They are also common in Spain, but for various reasons cork production has been concentrated in Portugal. Currently the small country produces half of all cork worldwide. Spain comes in second at 31%, and Morocco a distant third. 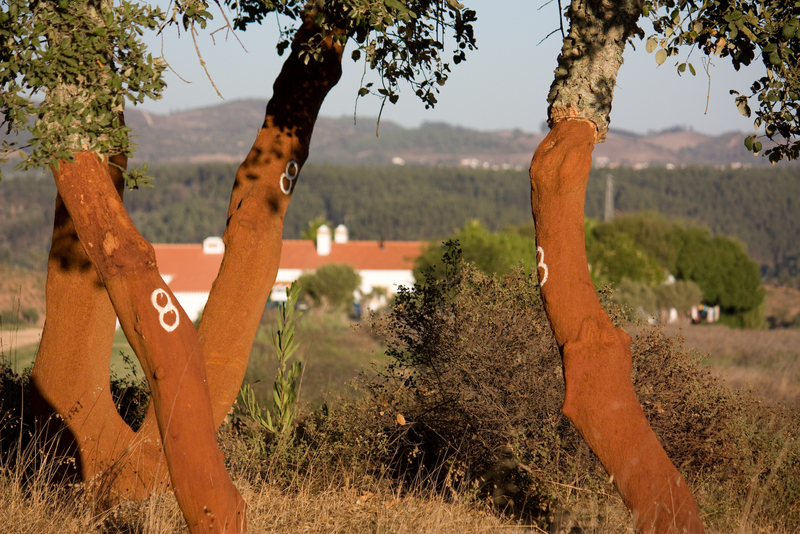 The significance of cork trees in Portugal has been recognized for centuries. It makes up 23% of the countries forests, and the first laws protecting the trees date all the way back to the 13th century. A law passed in the 1970s made it a crime to cut down a cork tree, dead or alive, without explicit permission from the government. In 2011, it was made the national tree of Portugal by unanimous vote. 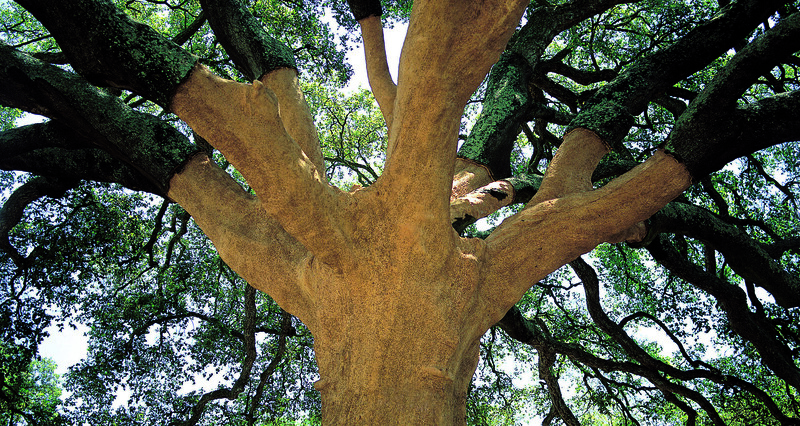 The oldest and largest cork oak in the world is located in Portugal’s Alentejo region. It was planted in 1783, the same year that the United States and Great Britain signed the Treaty of Paris, ending the Revolutionary War. The tree now stands more than 14 meters (45 feet) tall, and the diameter of its trunk is over 4 meters (13 feet). The tree has been harvested more than twenty times in its lifetime. The greatest was in 1991, when more than 1200 kg (2650 lbs) of cork were stripped from its trunk and lower branches. For reference, most trees are capable of producing about 45 kg (100 lbs) of cork each harvest, so this single harvest was more than most trees produce in a lifetime. It was enough cork for well over 100,000 individual cork stoppers. The tree’s name comes from the many songbirds that live in its enormous canopy. 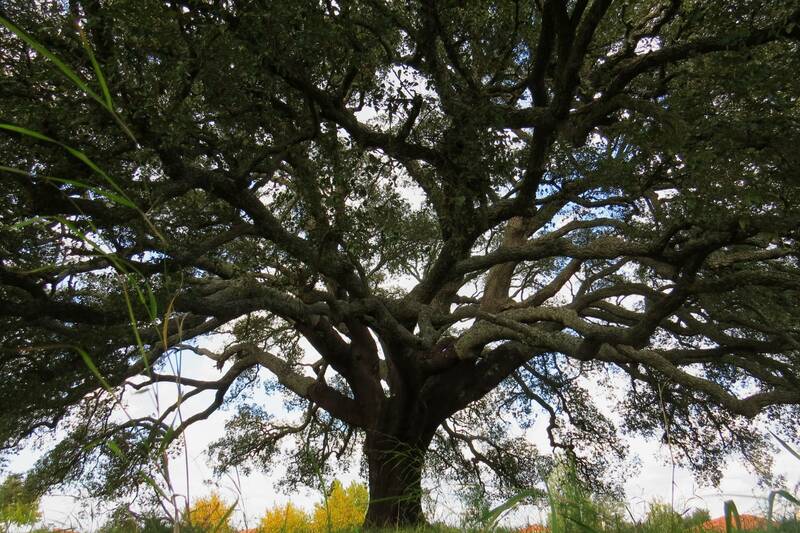 Cork oaks are evergreen, and provide shelter for many animals native to the Iberian peninsula. One such animal is the Iberian Lynx, which is critically endangered with an estimated 150 adults left in the wild. Other endangered animals that reside in cork forests include the Iberian Imperial Eagle and the Black Stork. Because of its cultural and environmental importance, the Alentejo region was submitted to UNESCO as a World Heritage Site candidate in 2017. If granted, it would bring the region international recognition, as well as funding and support for conservation. It’s currently on a ‘tentative’ list, but the full application process takes 18 months. With luck, the region will soon be officially recognized. If you enjoyed this article about the Whistler Tree, check out the archive for more tree stories. Also check out the Facebook page, with a few extra tree goodies throughout the week. Subscribe below to receive notifications whenever a new tree story is published. Whoa! That is pretty rad. There are a few of those trees around town, and I get asked about them often. Even though they fell corky, people are still surprised that cork grows on trees. There are lots of them here in Andalusia as well. I’ll do a separate article about them in the future. It’s pretty wild to see the bark piled up at the base of the tree! They are more popular in the old Portuguese neighborhood in San Jose. They make it easy to identify the homes of the the old families of Portuguese descent. However, my people and people of Spanish descent do not seem to be familiar with them. We have that useless strawberry tree, but no one seems to know why. Do you mean the madroño? I actually wrote an article about that last year: https://wp.me/p93oaX-74. Still haven’t really gotten a look at a real one up close though! Yes, the madrono. We do not call it. It is just a strawberry tree here. We have our own native madrone. I never liked the strawberry tree much, even though it is a good large shrub or small tree for our climate. It always seems dirty to me. Thank you for this fascinating information about a material most of us use regularly. Trees are amazing creatures! Very interesante Nick, I enjoy your articles a lot!!! So interesting and cool! Thank you! Glad you enjoyed it, Jennifer! Also thank you for sharing the lovely poem! Amazing story –what is the conservation status? I’ve read that a shift to artificial corks and screwtop lids is harming cork forests, because of lack of incentives to keep them. Thanks for the comment! It definitely is having an effect on cork forests, but as far as I know they aren’t under immediate threat. There will always be a market for cork stoppers (they signify higher quality wines to buyers) and the countless other cork products. They are also indirectly protected because they provide a habitat for several endangered species. I’ll write more about it in a future article about a natural park near where I live in Spain called Los Alcornocales (the cork oak groves). Probably a few months away from that one though, sorry! I’m not sure. I’d recommend asking in City Hall. They’ll have lots of older resources that aren’t available online. Hopefully they can at least point you in the right direction! An amazing writing on the Cork Tree. Its a wonderf creation of God. Thank you.